Welcome to the sixth installment of the Haunted Montreal Blog! Released on the 13th of every month, the October edition focuses our new ghost tour – Haunted Griffintown, plus research we are carrying out into the McLennan Library at McGill University. For the 2015 Hallowe’en Season, all of Haunted Montreal’s ghost walks can be booked for private groups and are scheduled in the public season! Haunted Montreal is pleased to announce Haunted Griffintown, a brand new ghost walk for the 2015 Hallowe’en Season! Griffintown is one of Montreal’s most historic neighborhoods – and one of its most haunted. The area has witnessed everything from dying Irish refugees during the Famine of 1847 to the Industrial Revolution to Montreal’s worst air disaster. Today, condominium towers are sprouting up in the Griff, but new residents are learning that the area was once a rowdy shantytown – and it’s also ghost-ridden! The Haunted Griffintown Ghost Walk visits mysterious ruins, abandoned tunnels, a polluted canal, former burial grounds and creepy old buildings that are said to be haunted. 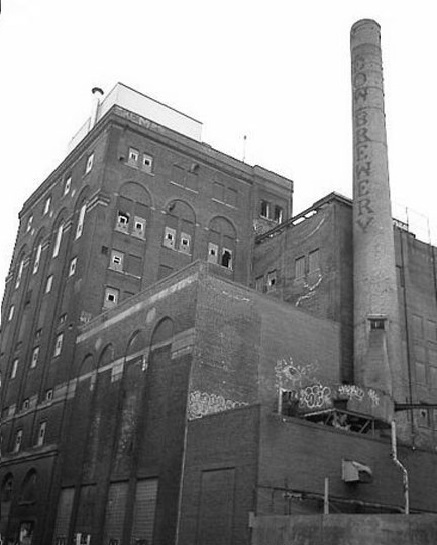 A vacant, decrepit brewery hosts psychics in search of a murdered girl, a condominium reminds locals of its past as a chocolate factory, and the ghostly ruins of St. Ann’s Church sometimes produce paranormal activity.Guests will learn about Black ’47, when the area witnessed one of Canada’s worst tragedies, as tens of thousands of typhus-stricken Irish immigrants disembarked from “coffin ships” after crossing the Atlantic Ocean. Despite heroic efforts by nuns and Mayor John Mills to care for the sick in fever sheds, the disease killed over six thousand people, including the Mayor himself. Most of the dead were buried in nearby mass graves, only to be disturbed again and again by industrial activity. There is also the tragic mystery of the Peel Basin, the site of many drownings over the years, including one recent case that may be connected to a will-o’-the-wisp – or a serial killer. Conspiracy theories also surround Montreal’s worst air disaster, when a Liberator Bomber slammed into the neighborhood, killing 15 people during WW II.Finally, the Griff is the setting for the tale of Mary Gallagher, the headless prostitute. Montreal’s most infamous ghost story, she was murdered and decapitated by her best friend Susie Kennedy in 1879. The headless ghost of Mary Gallagher is said to return to the Griff every seven years, still searching for her head! The Ghost Walk begins at 8 pm at the Griffintown Café (1378 rue Notre Dame Ouest, a few blocks south of Lucien L’Allier Metro). Guests should arrive at least 10 minutes before the tour starts to check in. For those wishing to dine or have drinks and tapas before the ghost walk, Haunted Montreal recommends making reservations at the Griffintown Café, an artistic bistro-pub with an exceptional menu. Click here for more information and to book tickets. For the 2015 Hallowe’en Season, Haunted Montreal is also offering final visits for both Haunted Downtown (Sunday, October 18 at 8 PM) and Haunted Mountain (Sunday, October 25 at 8 PM). We invite our clients who attended a ghost walk to write a review on our Tripadvisor page, something that helps Haunted Montreal promote its tours. In addition to the extensive research being carried out into Griffintown, Haunted Montreal has also been studying the mysterious spirit who haunts McGill University’s imposing McLennan Library. 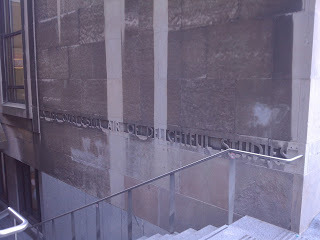 The words “In the quiet still air of delightful studies” are inscribed in the wall beside an outdoor staircase at the McLennan Library. However, according to rumours, the still air on the 6th floor is sometimes compromised by a spirit who is also known to disrupt the quietude and delightful studies that McGill is renowned for – by startling and terrifying unsuspecting students! Allegedly the 6th floor of the McLennan Library is haunted by the ghostly apparition of an elderly man who wears a strange old coat. He is known to float quietly above the floor, sometimes towards students who are deep in a book or librarians stacking the shelves. Once he selects his target, the apparition is known to glide up behind a person, then lurk, almost perfectly still. He stares intently at his victim until he is noticed. When the startled person reacts, usually by screaming and jumping up from their chair, this ghost is known to vanish into thin air, leaving the victim embarrassed for having disturbed the quietude that makes the McLennan Library famous. There is very little information as to who this apparition is or why he is haunting the 6th floor of the library. The concrete Brutalist structure housing the library dates to 1969, but it was built on the grounds where an elegant 19th-century mansion once stood. The beautiful home was named “Dilcoosha”, a Hindustani word often given by Indian princes and nobles to their garden palaces, meaning “The Heart’s Delight”. This exquisite home was originally the residence of Jesse Joseph, a prominent Montreal financier. 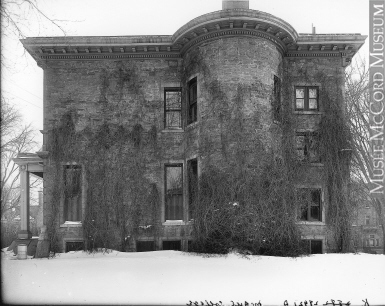 Dilcoosha was one of many elaborate mansions in Montreal’s Golden Square Mile. Designed in an exotic style known as Egyptian Renaissance, Dilcoosha featured high ceilings, a lavish interior, opulent furnishings, a curved central stairway and a charming circular upper hall with alcoves for statuary. Outside, a handsome garden burst with fragrant blooms. Jesse Joseph loved gardening and meticulously planned the grounds of Dilcoohsa to ensure a profusion of colourful flowers from spring to autumn. In life, Jesse Joseph was an energetic, life-long bachelor who enjoyed living in the aristocratic tradition, which included hosting and entertaining the city’s elite with lavish and elaborate parties in his resplendent mansion. In the summer, outsiders paused to admire Dilcoosha’s gardens and even in the winter people gathered there. The Snowshowing Club assembled there, at the foot of McTavish Street. 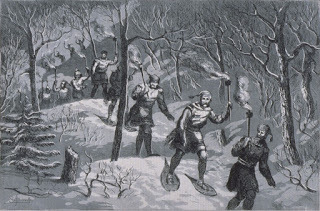 After lighting up fiery torches, they would ascended Mount Royal in a column. 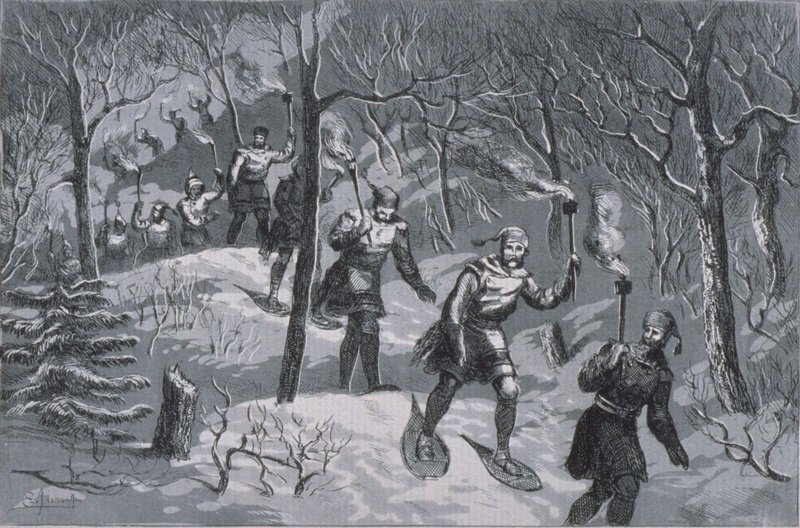 Clambering away on their snowshoes, they would often holler at the tomb of fur baron Simon McTavish on the way up to the summit, allegedly to “rouse his spirit”. On these dark and frosty nights, from the city below it appeared as though a fiery snake was slinking its way up the mountain through the barren forest. As the owner of Dilcoosha, Jesse Joseph enjoyed the attention he received. As a Jewish businessman with many interests, he served as president of both the Montreal Gas Company and the City Passenger Railway. He also operated the Theatre Royale, the Montreal’s finest theatre, promoted trade between Canada and Belgium (earning him the title of “Belgian consul in Montreal”), held vast real-estate holdings in the city and was a member of the executive for the SPCA. Ever the proud gardener, Jesse Joseph also spent countless hours in the winter planning his meticulous garden, which was said to be one of the most beautiful in the Golden Square Mile. Overall, Jesse Joseph enjoyed his reputation as a man of extremely refined taste. He died in 1904 at the age of 86.
Business interests purchased Dilcoosha with the hope of demolishing it to erect a luxurious Ritz-Carleton hotel on the site. However, a McGill benefactor named Sir William MacDonald objected, suggesting that Dicoosha should be incorporated into the campus instead. With his powerful business connections, in 1909 MacDonald was able to shelve plans for the hotel and buy the property, which he promptly gifted to McGill University. During World War I, Dilcoosha served as a headquarters for the McGill chapter of the COTC, or Canadian Officer Training Corps. 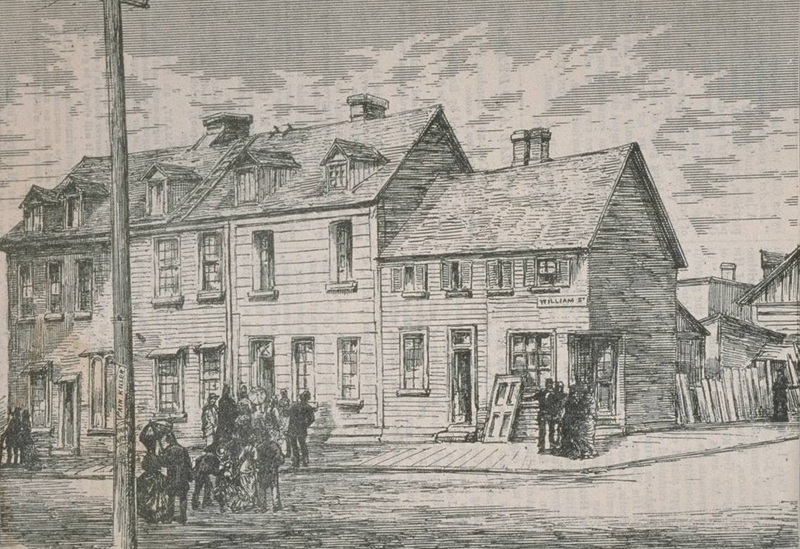 McGill University was active in recruiting and training soldiers from among its student body. Officers in training used the long upstairs hall at Dilcoosha as a target practice range, something Jesse Joseph would not have approved of. 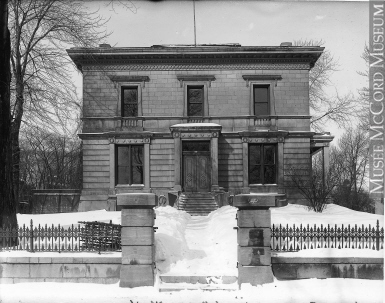 After the War, in 1919, Dilcoosha was transformed into the first McCord Museum. McGill inherited the extensive collections of David McCord, an eccentric municipal lawyer who had spent much of his life collecting rare objects associated with Canadian history. Dilcoosha, despite being bullet-ridden, was seen as an ideal place to house and display McGill University’s new Canadian artifact collection. In 1955, university officials detected structural problems in one of the walls at Dilcoosha. By now the lavish home was starting to appear faded and worn, so a decision was made to demolish it. 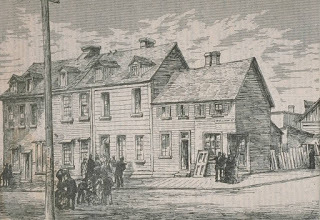 The McCord artifacts were relocated to the Hodgeson House on Drummond and Dr. Penfield Streets, and Dilcoosha was unceremoniously torn down. The once beautiful garden and exotic mansion were replaced with a weed-choked, vacant lot. There was some speculation at the time that, due to Dilcoosha’s demolition, Jesse Joseph was rolling over in his grave. After sitting empty for 12 years, the lot on the north-east corner of Sherbrooke and McTavish Streets was finally re-developed. 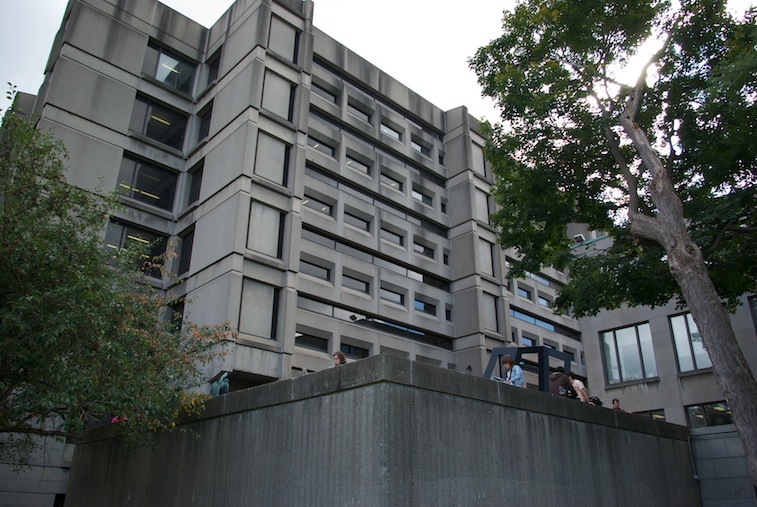 Between 1967 and 1969, the McLennan Library, was constructed in the Brutalist style. It was named in honour of Isabella McLennan, a benefactor who had given McGill University a small fortune to purchase books. The firm Dobush, Stewart, and Bourke built the towering, seven-storey structure using reinforced concrete. The chosen style was Brutalist. 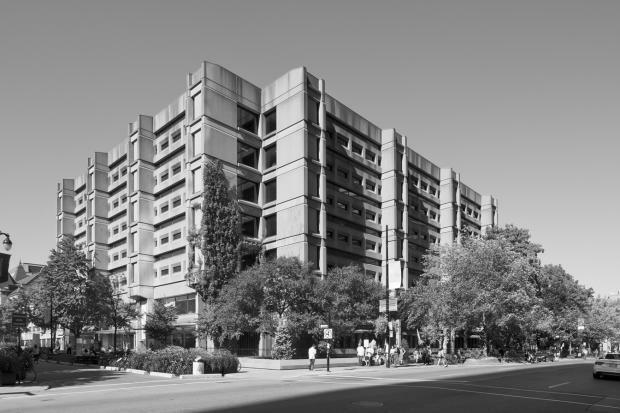 Brutalism is a movement in architecture that flourished from the 1950s to the mid-1970s. 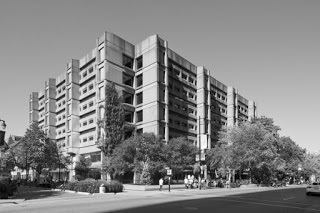 Part of the modernist movement, Brutalist buildings were usually designed using banal, angular shapes and constructed with reinforced concrete. The focus was on utility and not style. In many ways, the Brutalist architecture of McLennan Library is the exact opposite of Dilcoosha’s Egyptian Renaissance style. While Dilcoosha succeeded in being exotic, magnificent and exceptional, much like its owner Jesse Joseph, the McLennan Library is probably best described as soulless, banal and non-descript. While there is no evidence identifying the ghost haunting the 6th floor, there is strong speculation that the floating spirit is none other than Jesse Joseph himself. The most common description about this ghost is his “strange, old coat”, and old photographs of Jesse Joseph depict him wearing just that. 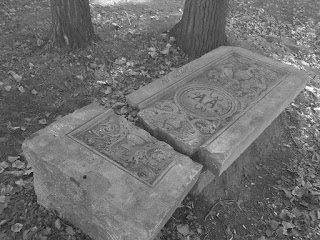 Many ghost stories involve people who, having died, return as spirits to sites of special significance. Did the ghost of Jesse Joseph remain at Dilcoosha after his death in 1904? The idea is perhaps not so far-fetched, especially given his love for his exotic mansion, beautiful garden, and his reputation as a man of the very best epicurean taste. If so, Jesse Joseph’s spirit would have witnessed his once-magnificent home fade into disuse before being hawked on the market, used for target practice by rambunctious students, and being jammed full of Canadian artifacts before its unceremonious demolition. The unique and beautiful Dilcoosha, once his pride and joy, was no more. Instead, the ugly, concrete, Brutalist McLennan Library went up on the site. While it is perfectly feasible that the specter haunting stacks of the library may indeed be Jesse Joseph, there is no explanation as to why he only haunts the 6th floor. One thing is certain – as a spirit known to float through the air, he would certainly have no difficulty getting all the way to the top of the McLennan Library. Coming up on November 13: Haunted Wellington Tunnel. 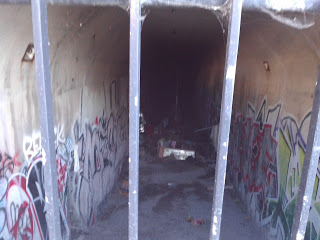 Hidden away in Griffintown, just off Wellington Street near the Lachine Canal bridge, lies a series of decrepit, abandoned tunnels. Covered in graffiti and protected by prison-like iron bars, the creepy Wellington Tunnel and surrounding area is rumoured to be haunted by the phantom of a boy wearing a suit. Constructed during the Great Depression in 1931, the various tunnels served cars, pedestrians and tramways, allowing ships on the canal to move more quickly. Previously, a swing bridge was located on the site. The tunnel developed a reputation as a filthy, fume-clogged, and dangerous place and was abandoned in 1995. Who is the young, well-dressed phantom haunting the vicinity?